Just as there would be no 007 without Q Branch saving every mission, the movie franchise is unlikely to have lasted so long – Q Branch overcomes the early complications with a quite stunning vehicle. A water jet powered speed boat that Q describes as a Hydro Boat. It also comes fully loaded, as they say in Gadgetmaster circles. Q does however admit that it is not finished, so we only get to see the torpedoes in action. We do however know that it has a grenade launching facility. The 350hp V12 engine is operated through a jet drive, much like a Jet Ski. This enabled the water borne craft to skim the surface of the water – as little as a few inches. It also has a lever that is inscribed with the exciting word ‘Dive’. When 007 pulls on it, the Q Boat descends beneath the water, thus allowing him pause to straighten his tie, before rising back up after clearing a very low bridge. It is also equipped with two ‘Jet Blast’ rocket motors at the rear of the craft which operate a turbo boost effect. This enabled 007 to take the craft onto dry land. With a top speed of 70mph and a zero to fifty speed of just 3.5 seconds, this little boat was among Q branch’s finest achievements. 15 of these boats were produced for the film. 8 survive. 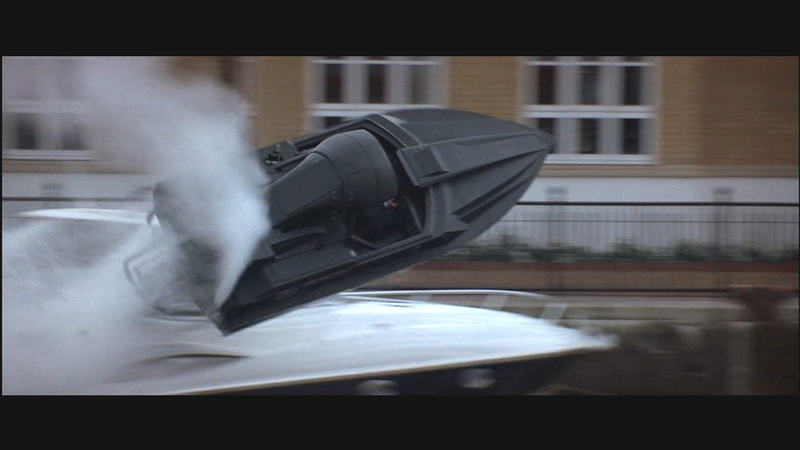 The Ian Fleming foundation owns the one that performed the barrel roll in the production. Only one other of the surviving craft was used. As an homage to the original Q (read more HERE), this would be called a Q Boat.